After having such an incredible day last Tuesday, my world (along with my daddy's, siblings', and our spouses') fell apart on Thursday morning. I was at school working on my new/old room when one of my SIL called me. I dropped everything and got to my parents' house as soon as I could. We knew this day would come, although we didn't expect it to happen as it did. My Mama went to be with her Maker in Heaven last Thursday. God took her the way she would wanted: quickly, before Daddy, and before her mind was too far gone. 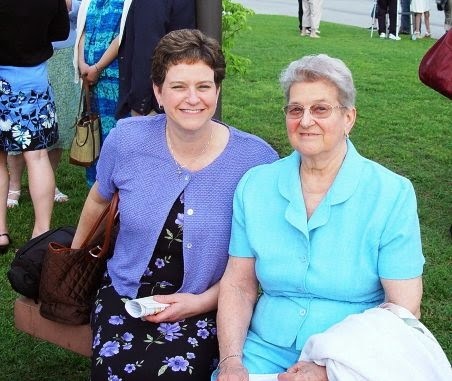 Mama was a devout Catholic; there's no doubt in anyone's mind where she is. I am so thankful that God saw fit to put me into a large family with this mama & daddy. They truly loved each other: they were married for 61 years. She, along with Daddy, showed all of us children what to look for in a spouse, and how to be a good parent. They taught us morality and compassion. They taught us how to laugh and not take ourselves too seriously. Mama taught us to love music...all kinds of music. At one time, she wanted to be a concert pianist, but then decided she wanted to eat (she wasn't too hyped up on being a starving artist!). She also thought about being a nun, but met Daddy and had 10 children. She was a nurse by training, which came in handy with all of us kids. She was beautiful...inside and out. She was always smiling (it hit me the other day that people say the same thing about me), even when she was in pain. She never, ever complained about her hip or back pain unless you asked her about it. And her laugh...How I loved her laugh. And her singing. She was the organist at church for 42 years and the choir director for most of that time. She & Daddy moved to this area shortly after the Catholic Church we attend began. She & Daddy very rarely missed Daily Mass. Mom would lead the congregation in singing the hymns during those masses. The priest told me on Sunday that she kept all of them in line when they needed it! Mama loved her family & God: Her family and the Church were her life. She was such an incredible woman and amazing mother. As one of my sisters said: we knew we were loved...always. I know there are going to be times when I think of things to tell her, ask her, or just things I see that I want to share with her. It's going to be hard to not be able to pick up the phone and talk to her. I'm going to miss her calling me and asking for help figuring out her cell phone or something on the computer when my oldest brother wasn't around or they didn't want to bother him. She is in a much better place: she's not hurting, and she's not worrying. I imagine she's up there praying for all of us, and getting started on lists that 1 of her friends said she's already hit her up for! I know she's reunited with her mama & daddy, and all of her siblings, and they're having quite the reunion, just as all of my siblings were getting together at their house. That's the way she would have wanted it. If you've lost a parent, you probably know the feeling of the huge hole in my heart that I have. I just wasn't ready for her to go, but then again, I probably never would have been. I'm just very, very grateful that she didn't suffer through a prolonged illness, because she definitely wouldn't have wanted that. So sorry for your loss. May God's spirit be with you. I don't think we're ever prepared to have our parents leave us. Thinking of your family and keeping your Dad especially in our prayers. Oh Mary, I'm so very sorry for your loss. Praying for peace and comfort for you and your family. Mary, I am so sorry for your loss. Eternal rest grant unto her, O Lord and let perpetual light shine upon her. May her soul, and all the souls of the faithful departed, through the mercy of God, rest in peace. Amen. I am so sorry for your loss. She sounds like she was a wonderful person and a great mama. I'm so glad she didn't have to suffer and that she is in heaven and you'll get to see her again. Praying God's blessings and peace on you and your family. I am so sorry, Mary. Our moms know us the best, loved us first (after God) and always are our best supporters and encouragers. I am so sorry for your and your family's loss. It is comforting that you know exactly where she is at and you will see her one day and then get to spend eternity with her. Wow, you resemble your mother so much. I'm so sorry. I can't even imagine. I'm glad you have a big family in times like this... lean on each other. Keep those images of her in heaven with her family... what a joyous vision of hope. Dear Mary, I'm so sorry for your loss. You have my deepest sympathy. This is such a beautiful tribute to your mother. I thank you for sharing her with us through your words. That picture of her is beautiful, and you strongly resemble her! The picture of you both, you will cherish I am sure. May God bless you and your family as you work your way through this chapter in your life. Hugs!!! I lost my dad in 2010 and I only get to see my mom at Thanksgiving. We live in different states..It's really hard. She is in a nursing home and I had to stop calling her on the phone, because she couldn't understand me. I'm just now seeing this, I'm so sorry! Praying for you and your family at this time! I am so sorry for your loss. I've lost both my parents and I understand the hole in your heart. And wanting to pick up the phone and realizing they're not there to answer. Prayers to you and your family. Oh, gosh. I'm so sorry for your loss. I can't even imagine... I will continue keeping you and your family in my thoughts and prayers. I am so sorry for your loss. You were so uplifting when I lost my mom a few years ago and I want you to know that I will be praying for you and your family now. Your mom was beautiful and looks like she was a joy to be around. May she rest in peace. I pray my children have as much of a loving mother as you have described. I can't wait to meet her in the communion of saints. God Bless your family with the comfort that only he can provide. I am so sorry for your loss. I will keep you and your family in my prayers! I'm so sorry for your loss! Your mother sounds like she was an incredible woman and you were very blessed to have had her. Soon Jesus will call us all home and we'll never be apart from our loved ones again!!! HUGS!! !